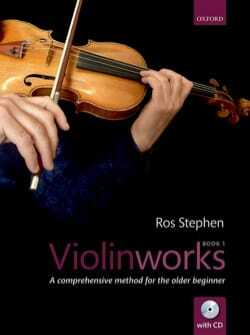 Violinworks, in two volumes, is a comprehensive violin method for older beginners and improvers. Book 1 takes students carefully from the very first steps to around ABRSM Grade 1 standard, and book 2 continues up to around ABRSM Grade 3 standard. The approach suits self-taught violinists as well as those who have teachers, and emphasizes the importance of good habits from day one, of using your ear, and of always aiming for the best sound. Each volume contains a wide selection of repertoire, plus detailed descriptions and photos to demonstrate correct playing positions. The accompanying CD includes performance tracks, with piano, string quartet, or band backings, plus aural exercises and downloadable PDFs of piano accompaniments. There are supporting video clips and additional resources on a dedicated website, making Violinworks a complete resource for anyone learning or returning to the violin.